This is a MASSIVE 1960’s vintage WAKMANN Chronograph measuring 40.5mm. in stainless steel with the original stainless steel bracelet.The original turning bezel is pristine, as is the amazing “panda” dial having inner tachymeter scale. The steel bevel-lug case looks amazing, with only a ding on the inner lower left bezel that could be polished if desired. The fine Valjoux 7733 manual winding movement was just cleaned and is accurate, with the chronograph functioning perfectly. 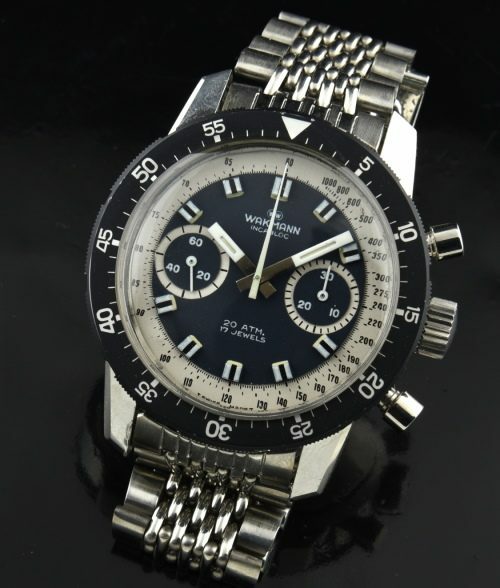 I can’t say I’ve found a better preserved example of this undervalued watch. Finding large and fine vintage chronographs such as this is becoming quite uncommon. I expect these to increase in value.